Our programs are successful through the dedicated work of many volunteers, most of whom are the parents and families of our participants. Participating in SYMTP can be daunting for first time parents. Here are a few things to keep in mind to decide if SYMTP is right for your child. One of the best ways to see if your child might be interested in our program is to bring them to a performance. 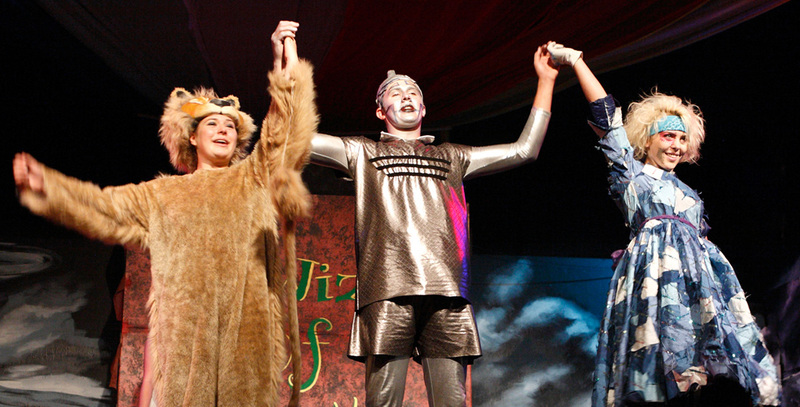 We have multiple productions during the year that include children of many ages. Your child’s reactions may range from excited to bored. It may help to ask follow up questions to see what they think. Our program is multifaceted so your child might be most excited by the prospect of acting, wearing costumes, singing, dancing or any of the other elements that go into our shows. What is Your Child Like? Our program has been serving children for over twenty years. In that time we have been able to serve children with many different personalities and needs. Almost all parents have found that their child has gained confidence, overcome personal, social or physical obstacles, or found a community of supportive peers through our program. Occasionally, we have parents say that their child would love our program but is scared of being on stage or is too shy. This may be true; however, our program endeavors to serve each child in the best way that we can, and our experienced staff is skilled at presenting attainable growth measures based on each child's comfort level. Also, the program is designed to slowly build the child's comfort level on stage and develop peer support so that by opening night few children describe feeling stage fright. If you are concerned that your child might be anxious about performing, we still recommend giving SYMTP a try and see how they feel after a couple weeks of rehearsal. When registering we include the dates of rehearsals and performances. Be sure to compare these to family plans or other activities that your child participates in. Include any conflicts, vacations or missed practices in your online registration. Missing portions of our program does not disqualify your child; however, this information may influence casting. The staff has to make decisions on what is best for all of the participating children. If we cast Child A in a role, but find out after casting that Child A will miss performances due to a family trip or other obligation, it is unfair to ask Child B to learn the part to replace them in the remaining time. Similarly, if we cast a child in a leading role then learn that they will miss three weeks of rehearsal, the participants who need to rehearse with that child are taking on an extra burden. Before registering consider if you will be able to consistently get your child to and from practice at the listed times. We recognize that modern parents are often juggling many responsibilities that make it difficult to always be punctual. However, similar to missed rehearsals or performances, children missing portions of rehearsal may end up feeling overwhelmed by not having been taught songs, dances or scenes that they still will perform on stage. A great solution for this is to connect with other parents and plan drop-offs and pick-ups. The families of our program are very invested and make a great supportive community. We consider ourselves very lucky for all their support. Sponsors cover over 50% of the costs for every participating child in our programs; however, some families need additional financial assistance. Select the financial aid option in the online registration form to learn more and apply. One of the best ways to help your child grow and succeed is to practice lines, songs, choreography and acting at home. This helps them learn their parts faster which allows them to have more fun at rehearsal by feeling more confident and less overwhelmed. This is also a satisfying way to see their growth and can make their on-stage victories even more celebratory for your family. SYMTP has many ways that parents and adult family members can volunteer. Sign ups are often available at the family orientation scheduled at the start of a new production.